please Ineed your support,I need to change mobile languge, how can I do this? please I need your support, How to chance the languge? Still haven't gotten PR1.2 update for my product code. So Sas!!!!! Anonymous, 02 Apr 2012now live traffic update will make more valuable n9.cheears all n9 owners. What do you mean by traffic update? 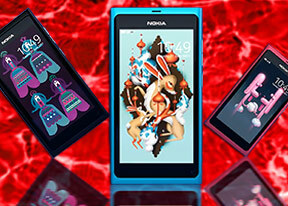 if u aint using a nokia N9 den u have a long way 2 go in mobile world tech. N9 should follow Lumia 800 ,and have another bigger screen like Mumia 900 ,a 4.3 to 4.6 inches screen ,browsing will be great. Its A very nice Phone But most of the Applications is not available like whatsapp, Nimbuzz, and Others. now live traffic update will make more valuable n9.cheears all n9 owners. can i install android applications after installing android in my n9? AnonD-14604, 01 Apr 2012No.It doesn't support facebook online games.If you are interested you can buy htc one x.It is ... moredid u ever seen or touch n9?,then why wrote a stupidity here? i installed firefox and flash... but the fb page that i entered was mobile page... thats why i cant play games in fb... anyone can advice me how you guys play fb games via firefox???? Please, does it support VLC player? Can it almost play video recorded not with mp4?Thanks. AnonD-14604, 01 Apr 2012No.It doesn't support facebook online games.If you are interested you can buy htc one x.It is ... moreYou sure you use N9? I can play FB games on my N9 with firefox and flash 10. Just can not play games based on flash 11.